Windows are a primary character defining feature of a historic home, yet are at the most risk for wholesale replacement during home renovation projects because homeowners don’t know how easy they are to repair. The result is often a costly project that diminishes the historic character of the home and actually increases long term maintenance and replacement costs. This is because most modern windows touted as “maintenance free” are actually better described as “unable to be maintained”. Unlike historic wood windows that can be repaired to function indefinitely, most modern windows have an anticipated life span of twenty years. After this time, the spring mechanisms give way and the seals around the glass fail, often causing condensation or fogging on the panes. Added to this, if the glass and/ or frame of a modern window is damaged by a projectile, the unit generally requires a factory repair or total replacement. 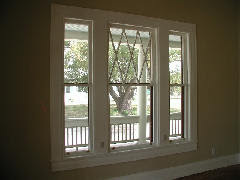 Compare this to a historic wood window that can be repaired by a handy homeowner or a local woodworker when the weights let loose, a pane is broken or sash rots. Another common fallacy about replacement windows is that they will save dramatically on energy costs. While most modern replacement windows offer a higher R-value than traditional windows, the resulting energy savings do not cover the costs of the replacement windows within their twenty year service-life. Other energy savings projects such as insulating the attic, adding weatherstripping around windows and doors, adding shading devices such as awnings and installing solar powered attic fans are better energy saving investments that don’t result in the loss of historic fabric of the home.